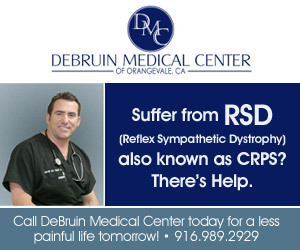 Reflex Sympathetic Dystrophy or, as it is now known, Complex Regional Pain Syndrome is an insidious disease of unknown etiology. Primarily it is a neurological disorder and as such affects not only the nerve endings as we know it but also internal organs and the musculoskeletal system and its ramifications are far reaching. The primary hallmark of this disorder is pain and in instances where this follows a traumatic event, the pain is out of proportion to said event. There are many other symptoms such as but not limited to swelling, color change, temperature change, hair growth and nail growth changes, and motor movement dysfunction. The pain is more often than not described as burning but frequently can be described as deep bone pain, sharp pain, dull pain, and many other adjectives have been used to describe this primary symptom. Diagnostic testing to make this diagnosis is extremely limited. Originally, it was thought that triple phase bone scan would provide information about Reflex Sympathetic Dystrophy but in my experience, they appear to be positive in only rare cases. Anatomic testing such as MRIs, CT scans, and x-rays serve only to rule out other disease processes. Electrodiagnostic testing (EMGs) are tests for motor disorders and of little value given that CRPS/RSD is a sensory abnormality. I have found that EMGs are almost always normal or show other problems than the underlying sympathetic dysfunction. Frequently upper extremities suggest median nerve entrapment (carpal tunnel syndrome) which is not clinically evident. Additionally, this test is extremely painful in patients with CRPS/RSD and therefore, in my estimation, should be utilized only on a limited basis. Current estimates suggest that there are between two and ten million patients with this disorder worldwide. It is my personal belief that if you subscribe to the theory that fibromyalgia is in fact not a distinct and separate entity but rather a sub-sect of RSD (as I do), that number can be as much as five times higher. Unfortunately, health care professionals are poorly trained in the evaluation of this disorder. It is frequently missed by many physicians forcing the patient to go doctor to doctor before arriving at this diagnosis. The estimate of the RSD Association of America (RSDS.org) is that the average patient sees 4.3 physicians before reaching this diagnosis. As with any disease, the earlier the diagnosis, the more effective the treatment. Unfortunately, therefore, by the time that the “4.3 physicians” are consulted, many patients have refractory symptoms that might have been improved if diagnosed and treated earlier in the disease process.